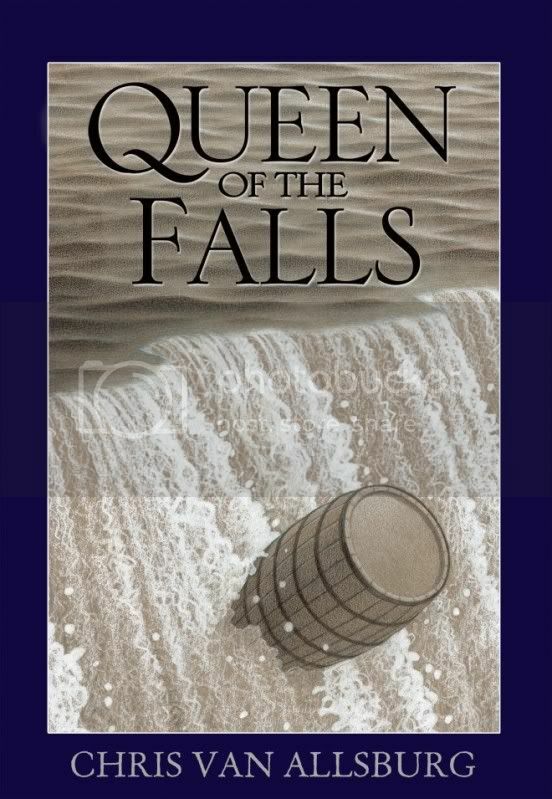 Van Allsburg gives us a close-up and personal look into the face of madness in this inspired history of the first person to go over Niagara Falls in a barrel. Tall pages dense with text contain a story nearly long enough to merit novella status in this exploration of a little known adventuress. Van Allsburg truly shines in his black and white pencil illustrations that lend heart to the story. He perfectly captures the Eureka moment when 62 year-old retired charm school teacher, Annie Edson Taylor, decides her fortunes will be made once she attempts the stunt. Her eyes gleam madly, as a flower vase is heedlessly tipped over at her table. Taylor's endearing and expressive range of emotions are displayed in full force in the next few pages. An angry scowl when ridiculed at the barrel-maker's shop, her shrewd squinting once the barrel-making is underway, and her quietly smug satisfaction in the office of Frank Russell, who was to become her manager, hint at her obsessive drive to complete a ridiculous and seemingly impossible task. The illustrations featuring her stout frame and grey-bunned head backing into the finished pillow-lined barrel, paired with an alternate view, a close-up of her face, as she cheerfully waves from inside the barrel as they nail her in, play with perspective and can't fail to fascinate readers. Her grimace as she's bandied about inside the claustrophobic environment ratchets up the tension, and the moment when she goes over, with a double-page spread of the Falls in all their glory and the single sentence "'Oh Lord,' she whispered, and then she was gone." stand in stark contrast to the rest of the text-heavy pages. After surviving the trip, albeit badly bruised and shaken up, sadly, Taylor finds the crowds she'd hoped to impress at state fairs and the like fail to materialize. She finds herself the victim of theft, as first Russell, and then her new manager, Billy Banks, both turn on her, and attempt to steal her barrel. The story ends on an upbeat note with Annie remarking that at least she can say, "I am the one who did it." The book is appended with an author's note, a list of "successful" barrel riders, a very short bibliography, and a photograph of the real Annie Edson Taylor, looking schoolmarmish posing next to the barrel in question, which is much narrower at the bottom than I'd imagined and covered in old fashioned font declaring Taylor, "Heroine of the Falls." Pair this unusual offering with Mordecai Gerstein's The Man Who Walked Between the Towers or any biography of Harry Houdini, for a slice of unconventional, dare-devil history. Recommended for ages 5-12.